Located on the Northern coast of East Falkland Cape Bougainville boasts large Rockhopper Penguin and King Cormorant colonies. These 2 species share breeding rookeries nesting together on the scenic cliff tops. Travelling time from the Capital town of Stanley is around 2 hours, with 1.5 hours of this being on the gravel roads that link the farming communities around the Islands. The off-road section is an easy driving relatively smooth track, and suitable for most individuals to travel over. Cape Bougainville is also often home to a number of Sea Lions – usually young males that have been forced to move out of the breeding rookeries further West at Cape Dolphin. These seals can regularly be seen sleeping on the cliff tops around the parking area, and in amongst the Tussock Grass. 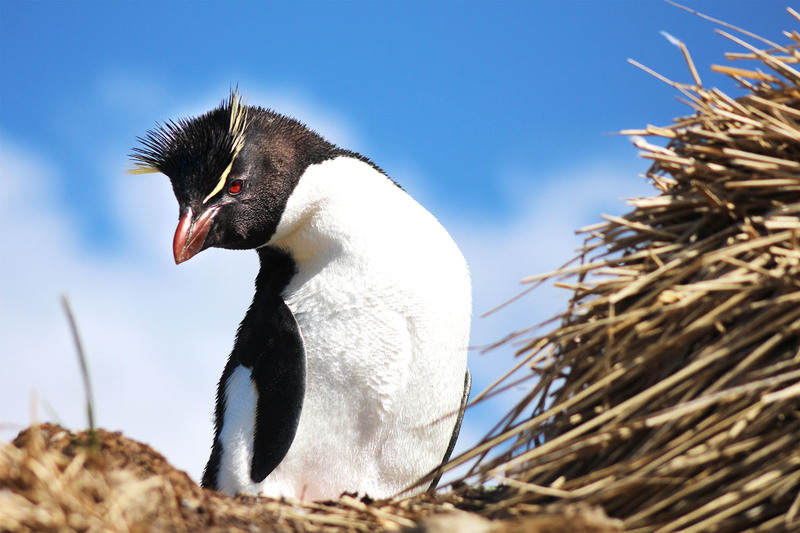 As well as the Rockhopper Penguins, Macaroni Penguins are frequent visitors, although in very small numbers (usually up to a maximum of 6 individuals during the breeding season). Inter-breeding between the Rockhopper and Macaroni penguins isn’t unusual, and mixed pairs can sometimes be seen here raising a chick. This is also an excellent location for watching the Rockhoppers hopping up the rock face from the sea after being unceremoniously dumped onto the rocks by the breaking waves. For the keen photographers capturing a cormorant coming in to land in the middle of a busy rookery, or the characterful Rockhoppers going about their business is a must. Visits to Cape Bougainville are carefully controlled with only one to two vehicles per day permitted. There are no restroom facilities at this location.